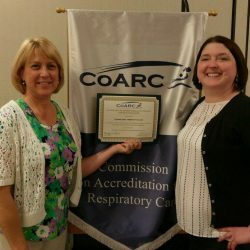 Reading, PA, On June 25, 2017, RACC was presented with the Distinguished Registered Respiratory Therapist (RRT) Credentialing Success Award by Commission on Accreditation for Respiratory Care (CoARC) at the American Association for Respiratory Care Summer Forum. In selecting programs for this recognition, the CoARC Board used objective criteria based on key accreditation metrics documented in the 2016 Annual Report of Current Status (RCS).These programs were required to: have three or more years of outcomes data; hold accreditation without a progress report; document RRT credentialing success of 90% or above and meet or exceed establish CoARC thresholds for CRT credentialing success, attrition and positive (job) placement. “Our Respiratory Care Program inspires graduates to reach their career goals. Our faculty and administrators have continually aspired to higher levels of achievement in both graduate and overall Program outcomes,“ says Mandy Harshberger, M.Ed., RRT, RACC Respiratory Care Program Director. “We extend a special thank you to our graduates, clinical affiliates, and faculty and staff for your hard work in achieving this goal. We achieved this award together,” she continues. To learn more about RACC’s respiratory care Associate in Applied Science Degree program, visit racc.edu or call 610.372.4721.